In the 1990's four accomplished professional musicians combined their varied experiences and talents to form Themselves, presenting programs of Irish music with historical commentary. We discovered that we worked well collaboratively, sharing our love of music, teaching, history and a sense of humor. In 2000, we wrote a script that wove a tale of Irish immigration into our concert performances, and, with the addition of a step dancer, gained success performing “An Immigrant's Story” in schools throughout CT. Inspired by the success of this show, we decided to create a second program. It took us about a year to solidify our ideas, do the extensive historical research, write the script, arrange the music and singing parts, gather the props and costumes, rehearse, edit and polish it all, and in 2004, “The Oregon Trail: A Tale of Westward Expansion” was launched. Again, we were successful and having a great time. Thanks to a grant from Arts for Learning, we were inspired to create a third show, which debuted in the fall of 2007- “The Road to Revolution: One Family's Struggle in Colonial Connecticut.” We continue to enjoy performing concerts of Irish music as a duo, trio or quartet, with or without Irish step dancing, and we are still having fun! WENDY KERNER, harpist, has toured extensively throughout the United States, has played for the Prime Minister of Ireland, the Queen of Thailand and other dignitaries and is principal harpist with The Bridgeport, Norwalk, and Ridgefield Symphonies in CT. She is a winner of the American Harp Society�s Concert Artist Program and was presented in her New York Debut in Carnegie Recital Hall as a winner of the Artists International Chamber Music Competition. Ms. Kerner began studying the harp at age seven and received her Bachelor and Master of Music Degrees from The Juilliard School. She teaches harp at Sacred Heart University and at her studio in Wilton, CT, with students of all ages. KATE O'BRIEN, violinist and vocalist, spent 10 years after college playing electric violin and guitar, leading her own dance bands doing rock, jazz, swing and country, and studying jazz with the legendary Linc Chamberland. She then returned to classical and acoustic music, playing in CT orchestras, chamber music groups, acoustic bands and musical theater shows. Through her company, OBRIEN STRINGS, she entertains as a soloist or with her ensembles. She continues to arrange a broad spectrum of music for all her ensembles, and teaches violin and viola at St. James School in Stratford and at her home studio. EDWARD WRIGHT, guitarist and vocalist, has appeared as a featured soloist with the Greenwich Philharmonia and the Westchester Chamber Orchestra, appears frequently as a soloist and is a member of the rock trios MOJO! and Broken Arrow. His music has been used in films and in productions for Insignia Films, HBO and PBS. He was a second-place winner and finalist in successive competitions at the American Finger Style Guitar Festivals. 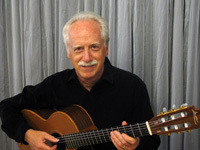 He has many CDs available and has published several collections of arrangements for solo guitar. Mr. Wright teaches at his studios in Greenwich and Rowayton. ERIN COLLINS, Irish step dancer, began dancing at the age of 6 and enjoyed a successful competitive Irish dancing career for more than 20 years. She was ranked in the top 5 in the New England region for 11 years, winning the title of New England regional champion in 2004. She also earned numerous World and All Ireland medals. In addition to her competitive achievements, she has performed with numerous well-known Irish artists. In 2014, after retiring from competitive dance, she became a certified Irish dancing teacher with An Coimisiun le Rinci Gaelacha, Dublin, Ireland. MONICA PETERSON, www.monicajpeterson.com, storyteller, teacher, and actress, has appeared at festivals, museums, libraries, schools, and senior centers. In addition to her one-woman shows, Monica also conducts workshops to teach storytelling skills to children and for teachers who want to use storytelling to improve students� language arts proficiency. As a certified teacher of both gifted and regular education, Monica�s work has been honored through the Spotlight Award for Excellence in Teaching and the Board of Education�s Staff Achievement Award. As an actress, Monica has appeared in commercial work, film, dinner theater, and recorded books.